In less than a year, the AirVisual Pro has been deployed as an outdoor air monitoring station in more than 40 countries, for some of which AirVisual Pros are the only data source. Citizens have chosen to take their local air quality into their own hands around the globe - discover where and why! On a typical January day in the Siberian city of Krasnoyarsk, the sun rises at 9am and sets at 4pm - shedding a mere 6 hours of daylight. Temperatures remain firmly below zero, sometimes dipping as low as -50 degrees Celsius. Meanwhile, what little sunlight the city does receive in these winter months can be blocked by impenetrable smog, a state the government has termed “black sky mode”. Though a beautiful city, Krasnoyarsk’s mountainous landscape and location at the basin of the Yenisei river puts the city at a disadvantage for dispersing pollution emissions. 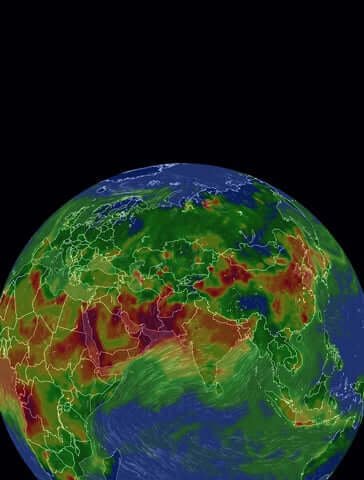 Smog generated from transportation and local industry, primarily three coal-fired power plants and one of the world’s largest aluminium smelter plants, frequently gets trapped in the atmosphere, creating a dense haze. On some occasions, the haze can become so thick it blocks sunlight from shining through to the city. During these spells of pollution-induced darkness, “black sky mode,” it is recommended that residents stay indoors and leave the city if possible. Igor, a young father living in Krasnoyarsk, first became interested in air pollution while considering the impact the visibly thick smog might be having on his children. Dissatisfied with the State’s quality of readings - he sought to take matters into his own hands by measuring outdoor conditions himself. Equipped with an AirVisual Pro air monitor, Igor was able to confirm his suspicions that State reported air quality readings often underreported the true situation. His motivations then shifted to 1) growing city-wide awareness of measured air pollution levels, and the associated risks, and 2) ending government complacency on the issue with an engaged community of concerned residents and data backed evidence for the problem. Initially, Igor’s readings were captured by the turn-key AirVisual Platform and shared to local residents by way of a project-devoted Instagram page, nebo.community. 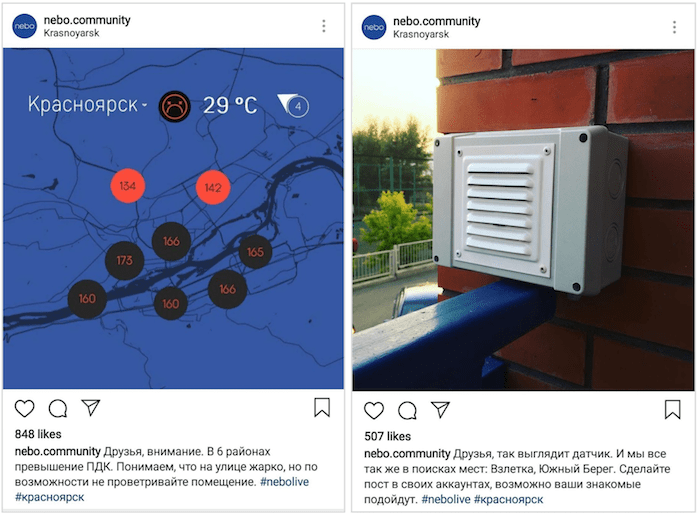 Using daily posts of real time air quality levels and the hashtag #красноярск (Russian for Krasnoyarsk), Igor was able to reach city residents and attract attention to the poor air quality conditions. After several months of active outreach and data sharing, interest and demand for more granular data grew. With limited funds to support the full potential of the project, however, Igor turned to his Instagram followers for support. By linking to a crowdfunding website in his Instagram bio and asking for help from the community, he was able to secure financing for 13 additional devices, as well as find new homes for stations in districts across the city. Today, there is no slowing down in sight for Igor and his Nebo Community. 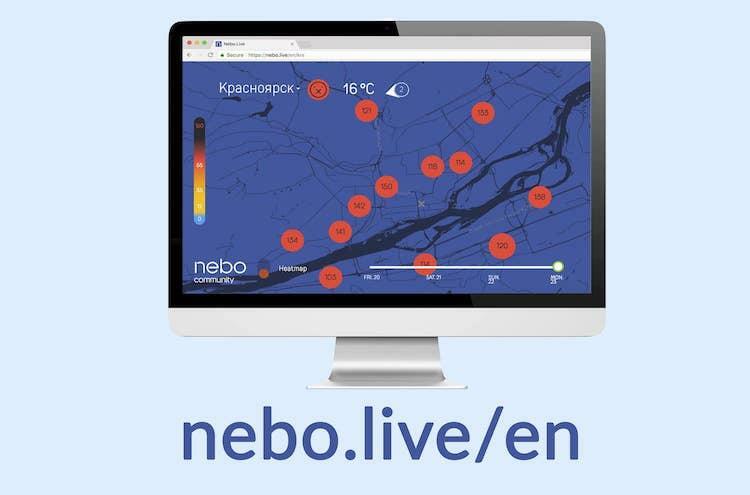 Using the device’s free API, which wirelessly shares the measured data in a codeable JSON format, Igor has developed his own own local reporting website (https://nebo.live), with advanced data features and options for tracking district funding for new monitors. With an impressive 20,000 Instagram followers, we can roughly estimate that one in every 50 people in Krasnoyarsk (population ~1 million), actively follow Igor’s account to get vital information regarding outdoor conditions. Recently, the government has responded to citizen demands by announcing that it will take action to reduce local emissions and improve city-wide air quality. Whether these statements are followed through with effective policy is yet to be determined, but with the city populace now aligned and impassioned on the topic - it seems the era of complacency is over. 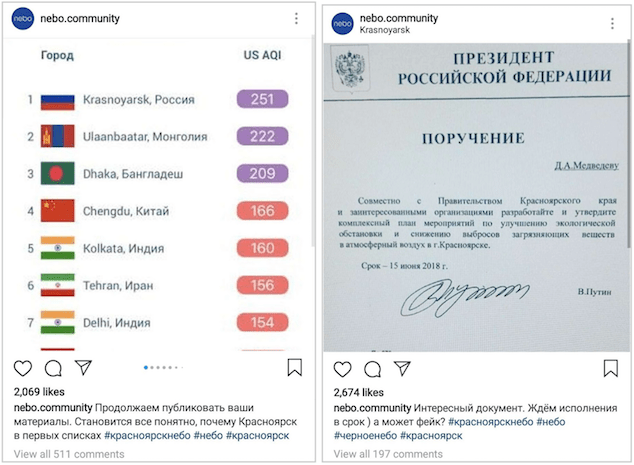 Nebo.Community shares an image of AirVisual’s Major City Ranking, reporting Krasnoyarsk as the hours most polluted city, and garners more than 2,000 likes (Left), - Formal statement from the Krasnoyarsk Mayor from February 2018 stating the city will take action to reduce air pollution within the city (Right).